Pianist and composer born in Krakow. He graduated from the Academy of Music in Krakow in 1988. In the years 1990-91, he was a Fulbright Foundation scholar and studied piano at the Boston Conservatory of Music in the US under the supervision of Janice Weber. He also learned from Victor Merzhanov, Włodzimierz Obidowicz, Michael Lewin, Jerome Lowenthal, and Johann Sonnleitner (harpsichord). He specializes in performing contemporary music. He was a lecturer at the Avantgarde Tirol Summer Academy of contemporary music in Austria. He also gave harpsichord performances. In the 1990s, he ran a series of lectures on musical instruments on the Wszystko gra TV show aired by TVP and TV Polonia. He worked as a score composer on many shows for young viewers on TVP and was the musical director of the Polish version of Sesame Street. 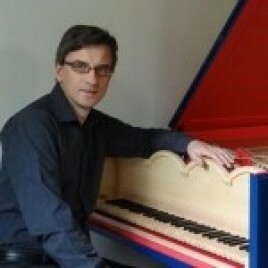 In 1994, he build a replica of Johann Sielberman’s harpsichord from 1775, while in 2009 he began works on a reconstruction of the viola organista (Geigenwerk, Bogenclavier), an instrument which has been almost completely forgotten throughout its over 500-year-long history. The pianist concert will start on 21st October at 9:00pm in The Church of Saints Peter and Paul in Krakow.